Most articles on differences of agile UX and lean UX are confusing and of no practical significance. To know their core principles, pros and cons and your judgement of their applicability in product development are enough. UX designers are no stranger to agile UX & lean UX, but for the new to this field, it’s not easy to distinguish between the two concepts. 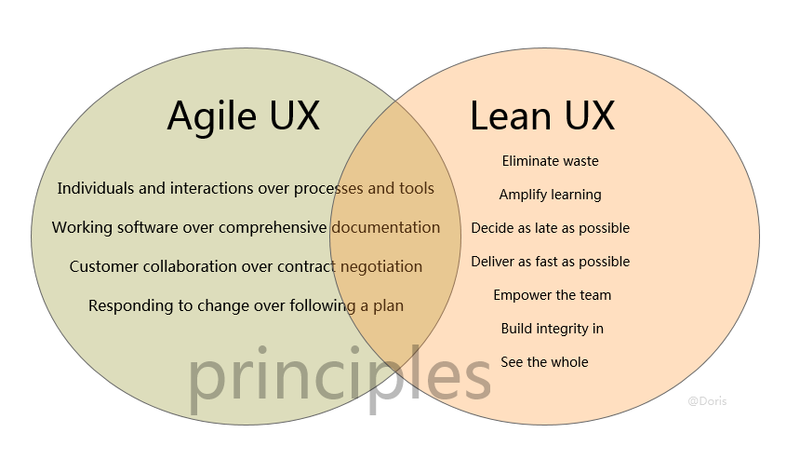 If you search for “agile ux vs. lean ux differences” in Google and read the articles listed in the result page one by one, you’ll be disappointed to find many points in them are controversial to each other. In fact, this wouldn’t be a trouble if we pay attention to its practical use when talking about any concept. As for agile ux & lean ux, the only things we need to know are their origins, core principles, pros and cons and our judgement of their applicability in product development. That’s enough. But there is one thing for sure: these two design methods are complement with each other and always in mixed use in real product design & development. Lean UX & agile UX are in fact put forward based on Lean Software Development & Agile Software Development. To better understand the former, let’s see the meaning of the latter two first. The term lean software development originated in a book by the same name, written by Mary Poppendieck and Tom Poppendieck. The book restates traditional lean principles, as well as a set of 22 tools and compares the tools to corresponding agile practices. The Poppendiecks' involvement in the Agile software development community, including talks at several Agile conferences has resulted in such concepts being more widely accepted within the Agile community. From the above we can deduce that agile UX and lean UX are two methods of User Experience design which have different focuses. Agile UX pay more attention on the high efficiency of the communication between all those involved, software delivery and development. Lean UX, which makes “user experience” as its core, focuses more on the matching degree of product and market. Both of them have their pros and cons but they are equally important in product design. In agile UX design, the product project is divided into multiple subprojects in early stage. Each subject was tested and is visible, can-be-integrated and workable. In other words, this is to separate a big project into several interconnected but independent small projects that can run on themselves. These subprojects are completed respectively, during which the product is always available. This method greatly improves the efficiency of designing a product and the responsive ability of the product. However, to make a good product will finally be a “user-related” problem. What is user? The complicated, non-binary living organism whose demands should be integrated to take into consideration in product design to provide the best user experience. This is the most obvious advantage of lean UX. Since this method stretch out the product design period, agile UX might be a better choice for those result-oriented designers. Aigle UX is not equal to low product quality, just like lean UX is not equal to low efficiency. As an embryonic model being built in the early stage of product design, prototype is used to test the usability of a product and its features. It is said that prototype design can reduce around 25% bug of a product. For both agile UX and lean UX, prototype is a very good way to stimulate designers walking out of comfortable offices, taking their “ideas” to clients and users and talking with them to dig the real demands of them. This guarantees that the “user-focused” core and “user experience-oriented” principles of the two deigning methods can be carried out.